Visual Visitor turns anonymous website visitors and website visitor tracking into qualified sales leads. When your sales team wants to know who is visiting your website, they are looking for much more than ip addresses and demographic data. They are looking for company names, email addresses, and phone numbers. Visual Visitor’s website visitor tracking tool can provide you with the real time data and the research tools that they need to convert those warm leads into real sales. Website Visitor Tracking and Anonymous Visitor Identification go beyond your typical analytics package to provide actionable data about those otherwise anonymous website visitors. And unlike other website visitor tracking services, your leads are yours. We do not charge per lead… Learn more about website visitor tracking and anonymous visitor identification from Visual Visitor here. If your company is looking to grow or enhance their Lead Generation strategies, then Visual Visitor is a must have! Anonymous Website Visitor Tracking and Lead Generation are popular tools among sales people today for one main reason: they work. Using Visual Visitor to gain information about the businesses visiting your website will help you more than any other service because we provide you with valuable information about prospects that are already interested in your products or services. And best of all… we do not charge per lead. They visit, you prosper! Instant Email Alerts that are sent directly to you or your team. 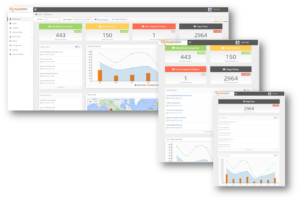 Our Dashboard (mobile friendly for those who work outside the office) which includes many detailed views of your visitors, traffic patterns, page view times, and more. Reporting options that come in multiple formats and detail levels that include a CSV download option for easy manipulation. Who is on your website. What products or services they are interested in. Email you while they are visiting your site. and provide you with a way to send that information directly to your supported CRM. Wouldn’t you like to Identify ANYONE? With Visual Visitor’s feature, Identify ANYONE, we go beyond identifying your website visitors. How do we do it? We provide you with the ability to create special links that will tag your visitors that come in through your newsletters, online marketing (Twitter, Facebook, Instagram, etc), or that you place in individual emails. This feature can be used to track specific clients’ interest levels, newsletter effectiveness, social media marketing effectiveness, and much more! Best of all, it’s easy to implement and to track with our Email Campaign Link Builder and Email Campaign Dashboard. Track the click throughs of current mailing/newsletters subscribers not only from the mailing, but during future visits as well! Don’t do mailings, but would like to take advantage of this feature? 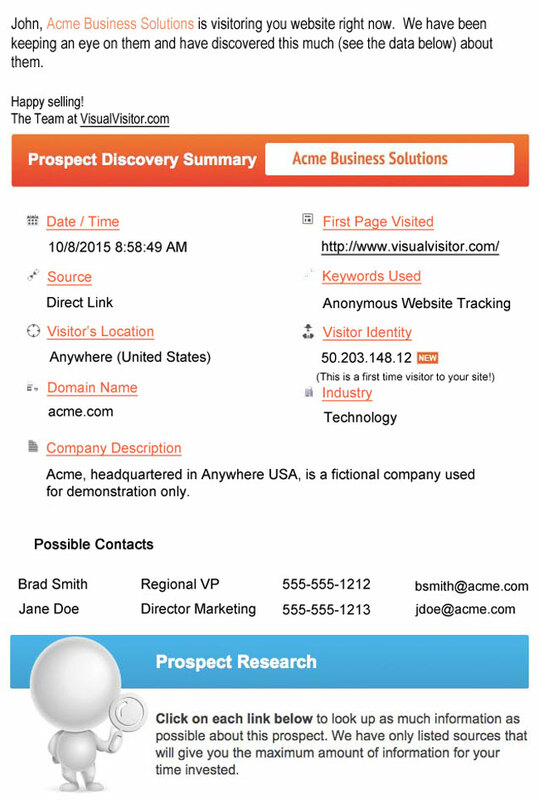 You can use the Visual Visitor Identify ANYONE email tracking script within one on one emails as well. Track the actual clicks to the links you send your customers or prospective customers. Manage this feature from the comfort of your Visual Visitor dashboard with our easy to use Email Campaign Link Builder and Email Campaign Dashboard. …best of all, it is included in your $59/month subscription! As much as we love to hate online forms, they can be an effective tool to grow your business. Forms can be used for newsletter signup, white paper download, request for more information, and a multitude of other things as well. With our Forms Capture Configuration page all you have to know is the url that your form is located on, we do the rest! Our system will go to that page, pull the data, and provide you with an easy to use Form Field Mapping page. At Visual Visitor we understand that many of our clients are using forms on their websites and would like a way to integrate that data with their Visual Visitor account. We have made it very easy to do that with the added ability to link directly to your supported CRM. Visual Visitor integrates with your current form. 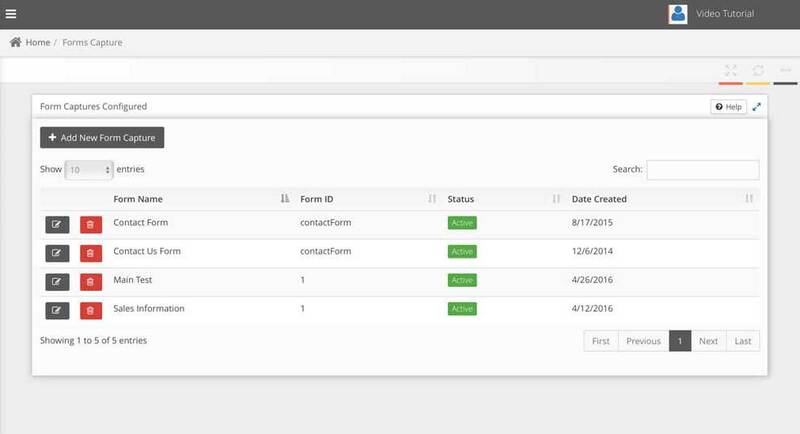 All form data is mapped directly to your account and easily configured through our Forms Capture Configuration. You can pull form usage data for quality. and again… it is included in your $59/month subscription! 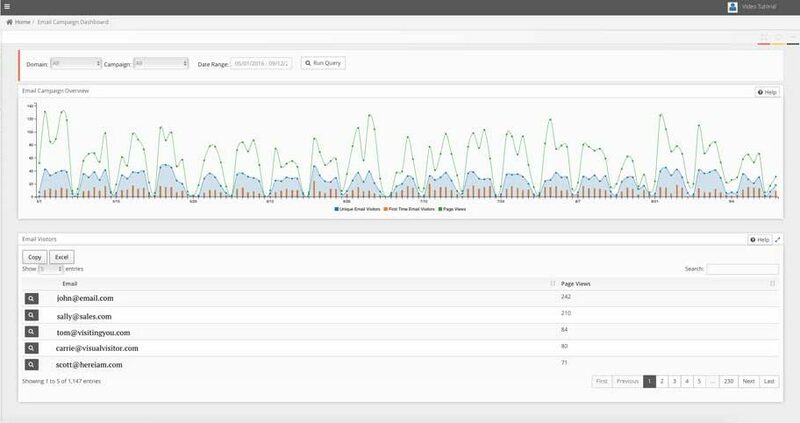 Consider the analytics package offered by Visual Visitor as Analytics on overdrive. That is what we provide to our customers at Visual Visitor. A good analytics package is a basic requirement for businesses operating online and Visual Visitor has a great one. Our analytics data goes beyond mere stats such as website performance, main traffic sources, and landing pages. We give you more detailed information like First Time vs. Return visitors, Unique visitors by device, engagement levels, and even more! Knowing more about your visitors empowers your business in so many ways. Our analytics package tracks the following information about your visitors to help you maintain a marketing advantage in the areas that will be the most benefit to your company. Unique visitor by device broken down by browser family. User engagement – First time visitors, Return visitors, Bounce Rate. 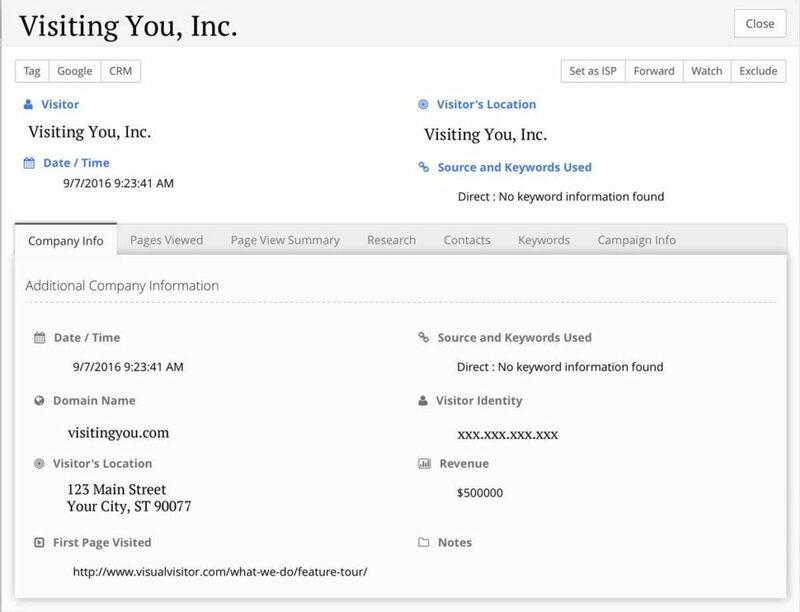 Visitor referrer – Direct vs Referral, Sources, and Keywords. See what happens after you click send. 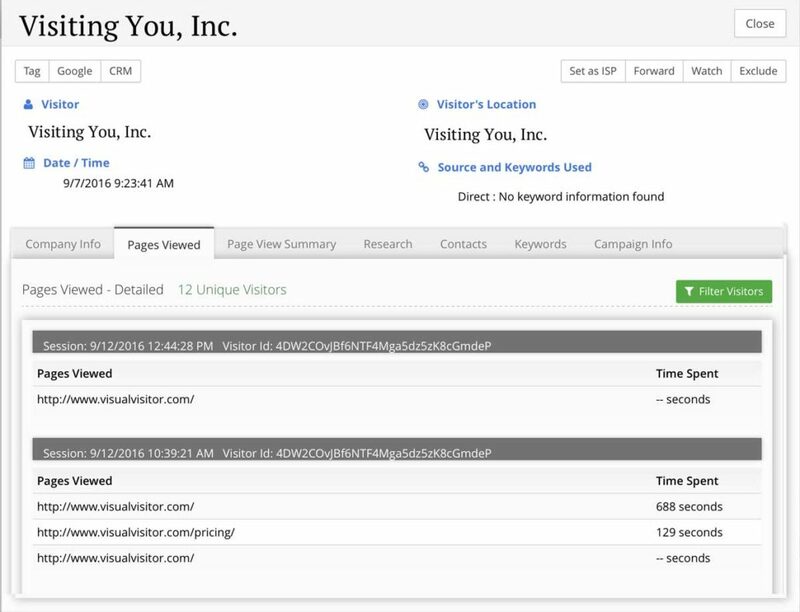 With the Visual Visitor Email Tracking tool, you will get both a desktop and an email notification as soon as the prospect opens your email as well as website link tagging. This notification includes location, open date and time, total opens, and time to open. With this feature, you will spend less time chasing leads and more time closing deals! Geographic location the email was opened from. Time it took to open after sending. Links within email set for tagging as done in Identify ANYONE. In simple terms, call tracking is the ability to trace phone calls back to the person who initiated the call, as well as the relevant advertising channel that prompted the call to your business. Until recent years, it has been almost impossible to determine exactly where your incoming phone calls have originated. 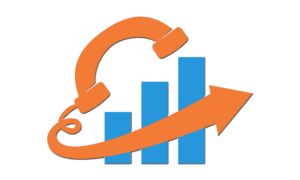 The latest call tracking software from Visual Visitor can help you determine which of your marketing efforts are successfully producing calls, and which are not. Would you like to automate tasks and share data among multiple web applications that your business currently uses? Visual Visitor allows you to seamlessly integrate with not only our current list of cutting edge apps, but also with hundreds more. Now using Zapier, you can connect your Visual Visitor lead generation results with more than 750 apps! Learn more about Zapier Integration here. Reporting is a staple for this type of anonymous website visitor tracker and lead generation service. Visual Visitor understands that and offers many different reporting options to fit the needs of our customers – from automated Daily and Weekly reports, to criteria based reports customized to fit your specific needs. Our reporting also can be downloaded to CSV files for easy manipulation such as per client, per page, per keyword, and more. The next time you are preparing for that client meeting, wouldn’t you like to run a report to know what products/services that particular client is interested in? It is a simple task with Visual Visitor’s easy to use reporting feature. Qualified Sales Leads. Visual Visitor’s anonymous website visitor tracking and lead generation software will identify those visitors to your website by name. We tell you which of your products or services they are interested in and we do this with real time email alerts so you don’t miss a beat! Knowing the pages viewed and the time spent on each of those pages shows you an interest level that can be a measurable way to determine the interest level of a potential client – or a current client. You just cannot get that with a cold call alone. Once you know how engaged your potential/current customer was while they were on your site, you can outline your sales pitch accordingly. The type of data that Visual Visitor provides to you can be an invaluable tool while growing your business, and for $59/month can you really afford to let it pass you by? Designed For Salespeople. Visual Visitor’s Anonymous Website Visitor Identification and Lead Generation tool is your tracking tool for real time sales leads and growth. 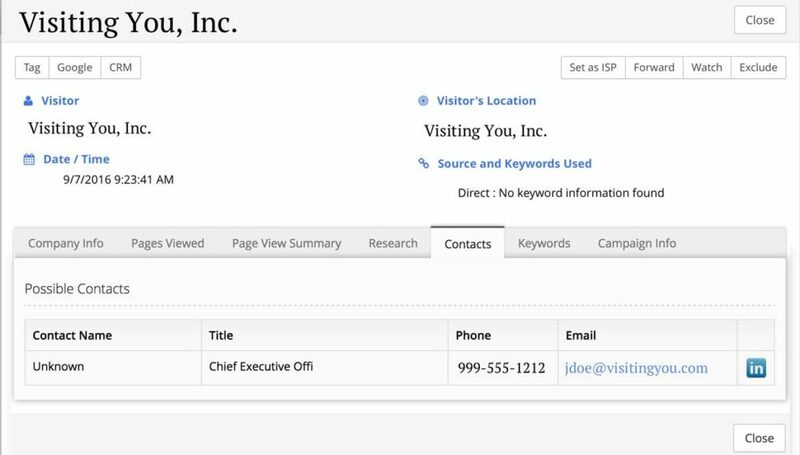 By identifying visitors to your website, receiving their contact information and our research tools, you can impact sales and your bottom line in a positive way. Designed to be easy to use, all you have to do is wait for your website visitors to show up. Visual Visitor does all the work by sending you real time notification of those visits in a mobile friendly Instant Email Alert. We even tell you which search engine and term they used to find you. Our Lead Generation tool includes an easy to use, intuitive Dashboard for your qualified sales leads filled with video help files – so that you can make the most from this powerful sales tool. It really doesn’t get any easier than that! Buying Signals: Who, What, Where, When. In sales, we all know that timing is everything. Getting to prospects when they are in the research phase will increase your chances of closing the deal. Did you know that only 1 to 2% of all visitors will ever complete a contact form or pick up the phone to call? We get you in contact with the other 98%. Visual Visitor is a easy, simple and automatic tool. Once it is installed, all you will need to do is follow up on the alerts that are sent to you or your sales team. We do it all with no visitor login or registration required. Visual Visitor runs transparently in the background of your website, gathering data without alerting visitors and eliminating the need to fill out tedious registration forms or logins. Using Visual Visitor to strengthen your current lead generation strategies will make it easier to turn those warm leads into real sales – and at $59/month, Visual Visitor is a must have for a growing sales team with an online presence. Our product is Easy to Install, Simple to use, and run Automatically in the background of your website. – After only a 5 minute install, you will be receiving real time updates of the (previously anonymous) visitors to your website. No Maintenance. No Consultants. No Implementation. We do all the work, all you need to do is follow up on those leads and close the deal! It’s just like Caller ID for your website!